Before was commissioned by Fishamble and has been in development with the support of the Arts Council, National Theatre Studio (London), Pavilion Theatre, and The Strollers Touring Network. This premiere tour is presented in association with the Strollers Touring Network. Before was commissioned by Fishamble and has been in development with the support of the Arts Council, National Theatre Studio (London), Pavilion Theatre, Georganne Aldrich Heller, Robert Leroy, and The Strollers Touring Network. FISHAMBLE AND PAT KINEVANE Fishamble produced Pat Kinevane’s first play The Nun’s Wood in 1998, followed by his second play The Plains of Enna in 1999. Fishamble is very proud to have commissioned, developed, and produced three solo plays written and performed by Pat, which continue to tour extensively. They are Forgotten (since 2006), Silent (since 2011) and Underneath (since 2014), all directed by Jim Culleton. The plays have been performed in over 60 venues throughout Ireland. Silent has won Olivier, Fringe First, Herald Angel and Argus Angel awards, and Underneath won Fringe First, LA Stage Raw and Adelaide Fringe Best Theatre awards, and was nominated for Offie/Off West End and Total Theatre awards. The productions have toured throughout Europe, with partners including Dance Base (Edinburgh), Soho Theatre (London), CCI (Paris), Prague Fringe Festival, Lokal Festival (Reykjavik), International Theatre Festival (Sibiu), Tron Theatre (Glasgow), Cymru Theatr Clwyd, Irish Festival (Oulu), GLAS (Geneva), Home (Manchester), INFANT Festival (Novi Sad), Brighton Festival, Hotbed Festival (Cambridge), nu:write (Zagreb), and to Leuven, Kaiserslautern, Trabzon, and all across Bulgaria. In the US, in association with Georganne Aldrich Heller, they were presented by the Irish Arts Center, New York, and in Boston Center for the Arts, the Source Theatre in Washington D.C. and the Odyssey Theatre in Los Angeles. In Australia, Silent toured with APA to Perth and Melbourne, and Underneath toured to Adelaide. The Pat Kinevane Trilogy continues to tour extensively in Ireland and abroad. ABOUT FISHAMBLE: THE NEW PLAY COMPANY Fishamble is an Olivier Award-winning, internationally acclaimed Irish theatre company, dedicated to the discovery, development and production of new work. In 2018 Fishamble celebrates 30 years of new plays in Ireland through its many productions and extensive development programme. Pat Kinevane is a native of Cobh, Co. Cork. He has worked as an actor in theatre, film, television and radio for 29 years. In 2016 Pat won a Laurence Olivier Award in London for his Outstanding Achievement as an Actor and a Writer this year. This prestigous award was shared with Fishamble and Jim Culleton who have been integral to the Production and Direction of Pat’s three Solo Shows. As a writer he completed his first full length play The Nun’s Wood in 1997 which won a BBC Stewart Parker Trust Award and was produced by Fishamble. Fishamble then produced his second play The Plains of Enna (Dublin Theatre Festival 1999). Pat wrote The Death of Herod for Mysteries 2000 at the SFX. In 2008 his piece Evangeline Elsewhere premiered in New York in the First Irish Festival. Denis Clohessy has previously worked with Fishamble, including the productions On Blueberry Hill, The Pride of Parnell Street, Silent, Underneath, Spinning, Mainstream and Strandline. He has also produced work for theatre and dance with The Abbey Theatre, The Gate Theatre, Rough Magic, Corn Exchange, Junk Ensemble and many others. He won the Irish Times theatre award for Best Design Sound in 2011 for Rough Magic’s Sodome, My Love, he was a nominee in 2015 (for Junk Ensemble’s ‘It Folds), was an associate artist with the Abbey in 2008 and was a participant on Rough Magic’s ADVANCE programme in 2012. His work in Film and Television includes the films Older than Ireland (Snack box Films), The Irish Pub (Atom Films), His and Hers(Venom Film), The Land of the Enlightened (Savage Film), In View (Underground Cinema), The Reluctant Revolutionary (Underground Films) and the television series Limits of Liberty (South Wind Blows) performed by the RTE Concert Orchestra. Jim Culleton is the artistic director of Fishamble: The New Play Company. For Fishamble, he has directed productions which have toured throughout Ireland, UK, Europe, Australia, New Zealand, Canada and the US, including 7 productions which have transferred to New York. 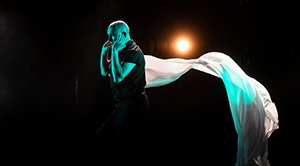 His productions for Fishamble have won over a dozen Irish and international awards, including an Olivier Award for Silent by Pat Kinevane. Jim has also directed for companies including the Abbey Theatre, Woodpecker/the Gaiety, 7:84 (Scotland), Project Arts Centre, Amharclann de hIde, Tinderbox, The Passion Machine, The Ark, Second Age, RTE Radio 1, The Belgrade, TNL Canada, Dundee Rep Ensemble, Draíocht, Barnstorm, TCD School of Drama, Frontline Defenders, CoisCéim/Crash Ensemble/GIAF, RTE lyric fm, Origin (New York), Vessel (Australia), and Symphony Space Broadway/Irish Arts Center (New York). Jim has taught for NYU, NUIM, GSA, Uversity, the Lir, Notre Dame, TCD and UCD.